For the Sega Master System and Sega Game Gear versions, see Ayrton Senna's Super Monaco GP II (8-bit). Ayrton Senna's Super Monaco GP II (アイルトン・セナ スーパーモナコＧＰ II) or simply Super Monaco GP II is a racing game developed and published by Sega for the Sega Mega Drive in 1992. 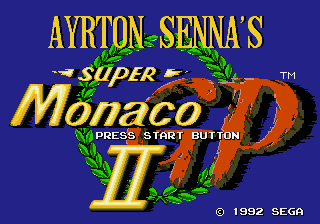 It is a sequel to Super Monaco GP, but this time the game is sponsored by Ayrton Senna (who won the Monaco Grand Prix six times). Also unlike the previous game, Super Monaco GP II was not released in arcades or for any non-Sega console or computer. At the time of release it was regarded as the most realistic racing experience on home video game consoles, and the fact that it was endorsed by Ayrton Senna meant the game was very popular. However, due to these celebrity endorsements, it is unlikely Super Monaco GP II will be re-released in the future without cutbacks. Like its predecessor, Super Monaco GP II lacks any official form of Formula One branding, and so has to invent its own teams and drivers. There are sixteen tracks loosely based on their real life counterparts. Designer: Kaki, Phenix Rie, L.C. Main article: Ayrton Senna's Super Monaco GP II/Magazine articles. Main article: Ayrton Senna's Super Monaco GP II/Promotional material.